First Class Scout Carter Klanderud from Fairmont, Minn., shoots a target at 3D archery. Photo by Al Drago. One of the many activities offered is the Bows, where Scouts, Venturers and staff alike have been letting arrows sail toward targets in the sport of archery. While there may be some serious ground to cover in order to get to the activity, most participants seem to agree that archery is an activity worth checking out. 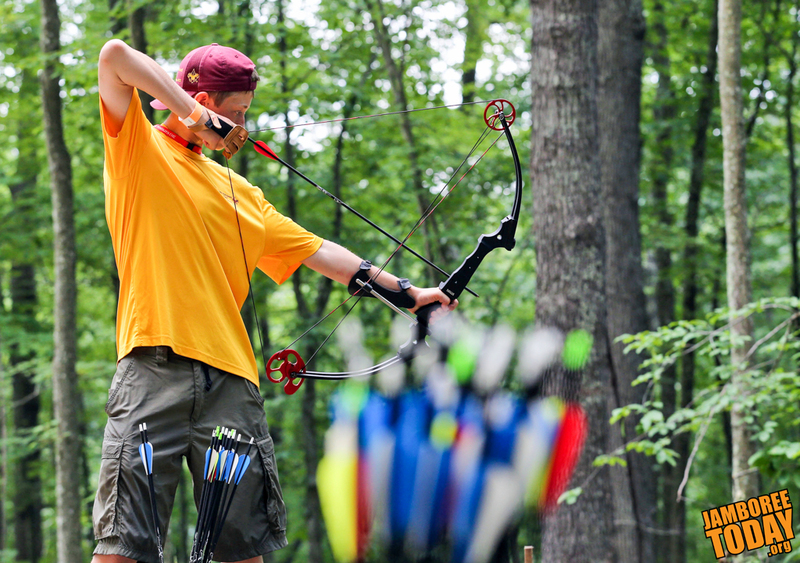 At the Bows, participants can use either recurve or compound bows and participate in a variety of archery disciplines: Static Archery, where archers shoot at normal targets; Olympic Archery, which is a longer distance than normal archery; 3D Archery, where archers can shoot at fake animal figures; and, Sporting Archery, where archers shoot small targets propelled into the air. Each type appeals to a different audience, and all of them are fun. The Bows is scheduled to be open one more day tomorrow from 8-5 p.m., and is closed briefly at noon. All participants in the shooting sports receive a safety briefing to ensure the safest environment at the range. "My favorite moment was up here [at Sporting Archery] when I hit the moving target," says Scout Jared Foerster. That moving target is a true challenge to hit; it's flying like a Frisbee. The Bows provides a special opportunity for Scouts and Venturers to experience the different varieties of archery sports worthy of lacing up the boots and making the trek.